Fire extinguisher is a real breath of protection when things go wrong with your car. They are extremely important to provide fire protection and also they act as defence tool. Other than that, fire extinguisher prevents many types of costly damage so they must be used to tackle emergency situations. Although people usually take them as red cans hanging on the wall or inside the car, but they are quite helpful in fire emergencies. Many businesses, non-residential structures and construction sites use fire extinguishers to stay safe from fire hazards. 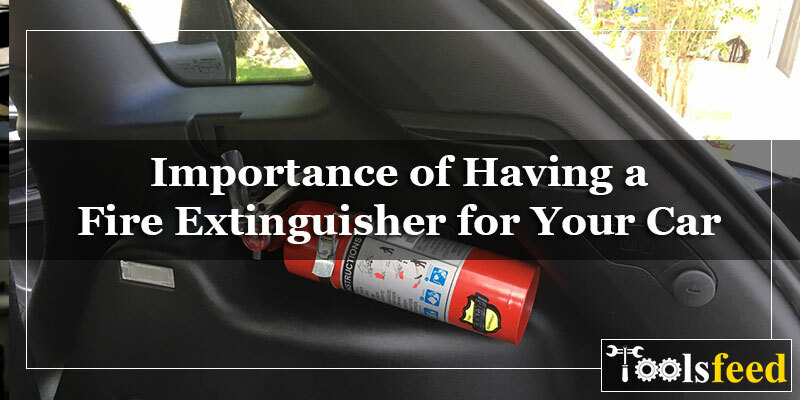 Since we are talking about the use of an extinguisher in your car, here are few important points about how it is significant having one installed in the car. What is the cause of fire? How to pick the right fire extinguisher? Having a fire extinguisher can be a lifesaver when the car engine catches fire. While this by no means can happen as there are quite lesser chances but still an extinguisher will help definitely. As you may know, a normal fire extinguisher cannot serve the purpose properly so you need a special one to put in your car because engine fire is the type of electrical fire which cannot be treated properly otherwise. Also, to prevent the car from a huge damage, car fire extinguisher is the right choice. Having a fire extinguisher is helpful for many other people if not for you. Driving the car and suddenly you see a vehicle on fire and it needs assistance. In that case, you can immediately go to that place with your fire extinguisher to prevent any further damage. Emergencies are rare but it’s always good to keep things handy to avoid such situations. As we have the first aid box for emergencies, extinguishers are a great help to protect many people. Coming to the cabin area fire, this can happen sometimes but not often. Having a fire extinguisher in your car allows you to deal with particular type of fire that can ruin the cabin area. The fire in cabin area is far more dangerous than the engine fire and also it is common so it becomes significant to have a fire extinguisher in your car to prevent such loss as it can lead to death. With fire extinguisher, you can save your children, family or anyone else travelling with you. In case the cabin area catches fire, extinguisher can come in immediate use to save you from huge damages. Not only the large fires, but small fires caused by mechanical or electrical problems can also land you into big trouble. So having a fire extinguisher right away will definitely avoid a serious and life threatening problem as you don’t have to wait for anything else but just use the extinguisher quickly to get rid of it. When a car catches fire, it will definitely ruin it and having a fire extinguisher in your car will help you deter the expensive costs associated with property damage. As fire can cause serious damage, the moment when you see flames, get hands on the extinguisher and spray it. And if in case, the fire is about to reach gas or fuel tank, the extinguisher will act like an angel that will save you from death. As the gas tank will explode, it will be a life saver. The inside of the car is controllable with the fire extinguisher but the outside is also covered. As and when you see small fires or flames anywhere like a garden, park, or camping site, pull the extinguisher out and save everyone around. There can be many causes but only a few of them are known. Here are two major causes of fire accidents happening in the cars which you can avoid by fixing these issues. Faulty electrical system is one of the major causes of car fire. As the car battery charges, hydrogen gas gathers under the hood and frayed wiring in the battery creates a type of current that has the potential to put everything on burning. So basically, car battery can be a cause. Regular maintenance of your car is very important to keep it running and in good shape. Failing to do so will definitely push it to damages and fire can be the biggest damage. Due to leaks or broken parts, short circuits can happen leading to fire hazards. Fire doesn’t need any reason to break out as large percentage of fires happen without reason. There is everything to ignore or nothing to ignore, it all depends on you how take things. Fire starts without any warning signal so if you want to come out safe from the car, have a fire extinguisher always ready. Now the matter of concern is that how to pick the right fire extinguisher for your car that serves you the best and quick. Every car is different with different engines, accessories, battery types and interiors. Usually, the extinguishers made for car are entirely different from that made for household purposes. Extinguishers for cars are generally smaller and a 2 pound extinguisher works wonders for your car. But larger vehicles do require large sized extinguishers to perform well. It is important that whichever extinguisher you buy, it must be able to deal with different types of fires like gas, electrical and oil etc. Talking about the best extinguisher, dry powder is the best as it is the least damaging one which when you use in the engine, it does the least amount of damage. Getting a fire extinguisher is not challenging but getting the right type is. You should know what type of functioning it has when you need it, is it easily accessible, and if it functions properly? Buy the one which you think the most suitable for your car.